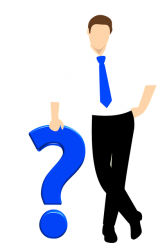 Software FAQ | ESRD | Engineering Software Research and Development, Inc.
Below are Frequently Asked Questions (FAQ’s) about ESRD Software installation, licensing, features, usage and more. The software FAQ page will be periodically updated with fresh FAQ’s, tips & tricks. Can’t find what you’re looking for? Contact ESRD Support. Why Is There a Recommended Maximum P-level for Isopar Automeshes? Why is a Nonlinear Solution Failing? Why Do Small Features Sometimes Appear Distorted? Why Do I Receive An Error Message About Associativity When Creating or Deleting Geometry? Why Do I Have Duplicate Geometry or Mesh Objects? Why Do I Get An Error Message During Application Of TLAP-Bearing? Why Are There Stress “Spikes” In My TLAP-Traction Application Surface? Why Are There SIF Drops At Free 3D Faces? Why Are Certain Objects in a Model Not Displayed? Why Am I Getting An Incorrect Load Check Summation For TLAP-Bearing? Which Nonlinear Solution Type (i.e. Material or General) Should I Choose? When Is Incremental Plasticity Theory (IPT) a Viable Option? When Can I Use Rigid Body or Node Constraints? What’s the Difference Between the SCW and SCP File? What’s the Difference Between DeLast and Undo? What is the Size Input for Local Automeshing? What Is the Midsides Input, and What Does It Control? What Is The General Automeshing Strategy For A 3D StressCheck Part? What Is The Applicability Of TLAP-Traction? What is Required in a Fastener Element Analysis? What If My Desktop Machine Gets “Cannot Connect To License Server System” Error? The firewall on the server machine is blocking incoming requests or the license server has been stopped. Disable the firewall, make sure the license server is running and try again. To diagnose on the server machine, ensure that lmgrd.exe can run from a command line on the server machine. What If ESRD Products Fail To Open With A Valid Node-Locked License? Are you connecting to a computer via remote desktop? ESRD products will not run on a physical or virtual machine using a node-locked license when accessed via remote desktop. This is due to the design security of our license manager, FLEXnet. If you would like to run ESRD products on a computer remotely, please contact ESRD Support to upgrade to a floating license. What Does the Object Resolution in View Controls Do? What Does the LAPACK Solver Error Typically Mean? What Does StressCheck Professional Use As Its CAD Kernel? StressCheck® uses Parasolid as its native CAD kernel. The native format is .x_t, or the Parasolid Transmit format. StressCheck® integrates multiple CAD translator options to convert from IGES, CATIA, Pro/E and others to Parasolid format. These modules are sold separately. What Do the MeshSim Global Automeshing Parameter Inputs Affect? What Can Cause Multi-Body Contact Load Transfer Issues? What Can Affect Fringe Plot Rendering Rates? What CAD Formats And Versions Are Supported in StressCheck Professional? StressCheck® Professional can natively import Parasolid files of versions ranging 10.0 to 26.0.151. Other CAD formats require licensed translators. Note: CATPart files created in V5R1 that have been opened and re-saved in a later version of CATIA V5 are not supported for 3D InterOp Graphical and 3D InterOp CGM. Note: CATIA V6 users should export their database objects as CATIA V5 CATParts, CATProducts, XCGM, or as 3D XML, which can then be imported into applications using InterOp. Note: NX .prt extensions must be changed to .ug to avoid conflict with ProE files. What Are Valid Extractions of Stress Intensity Factors (SIF)? What are the Nonlinear Solver Limitations with Multi-Body Contact? What Are Some Tips & Tricks for Using Parts and Solution Configurations? On Which Operating Systems are ESRD Software Products Supported? StressCheck® Professional and StressCheck®-Powered Apps are designed and certified by ESRD to install and run on Windows 7 and Windows 8 64-bit. StressCheck® Professional v10.3 and v10.4 have been tested to meet all of the technical requirements to be Windows 10 compatible. Minimum hardware and software configuration requirements can be found here. Is There A License-Free Version Of StressCheck I Can Install? StressCheck® Student Edition supports 2D analyses for planar, plate bending, and axisymmetric models. Elasticity and Heat Transfer theories are supported. Linear & Modal analysis types are supported. Fracture Mechanics extractions are supported. The maximum model size is limited to 15,000 degrees of freedom. Advanced meshing tools, StressCheck® Composites module, and CAD translators are not available. Full HTML and PDF documentation is included. Is StressCheck Multi-Threaded? And How Are CPU Cores Allocated? Much of the current StressCheck® Professional code base is single-threaded, though over time ESRD is working to improve as much of the code as possible to be multi-threaded. Therefore, the current release of StressCheck® is more multi-threaded than previous releases, and less multi-threaded than it will be in future releases. Additionally, the current release of StressCheck® does not yet support parallel/multi-core processing. How Often Do ESRD Software Products Check Licensing? The StressCheck® Core license remains checked out while StressCheck® is open. Once StressCheck® is closed, the license will be released back to the server after a few minutes. Typically, a solver license is released “in session”, meaning users should not have to close down StressCheck® to release this license once the solver completes or fails. Once the solver completes or fails, the solver license will be released back to the server after a few minutes. How Much Difference in Mesh Density Across a Contact Region is Acceptable? How Do I View Radial and Hoop Stresses/Strains? How Do I Use the Edit Toolbar to Select, DeSelect, Blank and Unblank Objects? How Do I Use Sets to Select and View Groups of Elements and Other Objects? How Do I Troubleshoot Small-Feature Automeshes? If running StressCheck® Professional or another ESRD software product for the first time (or after having removed all ESRD software product licensing references), you will be prompted with the ‘Specify StressCheck® License Path’ dialogue. Here you can specify a local license file or point to a license server. Read Tip #4 on our Installation and Licensing page for more information. How Do I Set Up A FLEXnet License Server for ESRD Software Products? StressCheck® uses the FLEXnet license manager from Acresso. If you are already using FLEXnet to manage licenses for other applications, you may simply append the license keys provided by ESRD, into your standard FLEXnet license file (usually license.dat). Alternatively, you may maintain separate license files for each application. For additional details concerning FLEXnet license serving options, consult Tip #3 on our Installation and Licensing page. How Do I Select Internal Surfaces for Locate Sets? How Do I Select Contact Constant For Multi-Body Contact? How Do I Round A Parameter To Nearest Integer Value? How Do I Report the Final P-Level of Each Solved Element? How Do I Replace ESRD Software Licenses On A FLEXnet License Server? The new license file FEATURES should now be seen by the FLEXnet license manager. How Do I Remove References To ESRD Software License Pointers? It is best to delete these registry values, and then start StressCheck®. When the license finder appears, simply point to the server. One can always define the Environment Variable “ESRD2_LICENSE_FILE” and provide the path to the appropriate license file. Note: An option for floating licenses is to unplug your Ethernet cable, and start StressCheck®. This will also cause the license finder to appear. How Do I Query the Path to My Current License File or Server? Hit “Enter”, and the path to the license file and/or license server will be returned. How Do I Point to a New License File or Server? 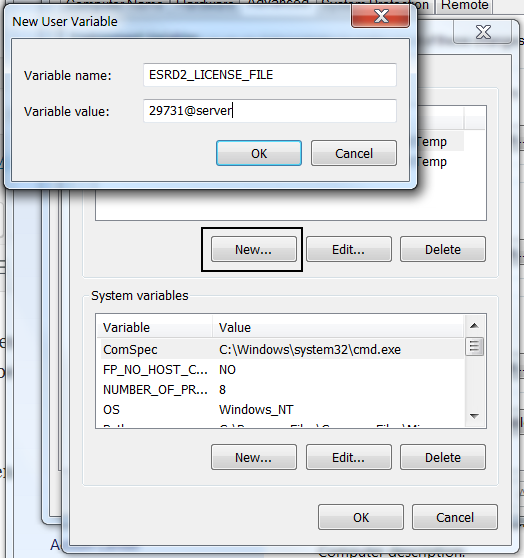 In System properties, go to Advanced system settings, then “Environment Variables…” Then, click “New…” and set the variable name to “ESRD2_LICENSE_FILE” and the variable value to the license path or PORT@SERVER. Then click OK.
For example, if the new license file is located in “C:\My Documents\license.dat”, you will need to set the value to this. If the license server is “29731@server” (as in the above capture), you will need to set the value to this. When you start an ESRD product, it should use the “ESRD2_LICENSE_FILE” value. How Do I Perform A Silent Installation Of ESRD Software Products? Windows does support a silent installation option for all .msi files. Msiexec is the program that “interprets packages and installs products” (see links below) and can be run from the command line. Please note that any command line installation must occur from a command line being run as an administrator. For StressCheck® 10.1 and higher, the property INSTALLLEVEL can be set to 5 to indicate all features should be installed (a “Complete” installation). 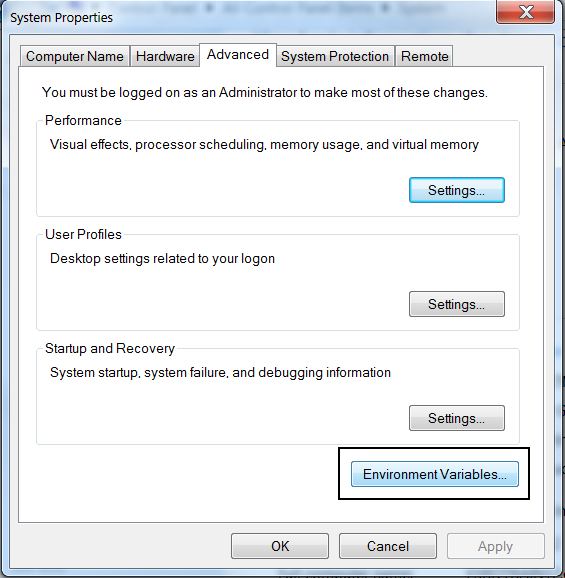 If INSTALLLEVEL is not specified, StressCheck® will default to a “Typical” installation. How Do I Move My Imported CAD to A Different Location? How Do I Install ESRD Software Products On A Desktop Machine? Installing ESRD software products is as simple as double-clicking the MSI and following the instructions. Read Tip #1 on our Installation and Licensing page for more information. How Do I Install ESRD Software Licenses On An Existing FLEXnet License Server? Note: you must have Administrative privileges in order to properly install FLEXnet. 1) Download the FLEXnet 11 License Manager package from the ESRD Resource Library. 2) Unzip the package, and navigate to the \FLEXnet_11\FLEXnet folder. Right-click on setup.exe, and click “Run as administrator”. 3) Follow the instructions to install FLEXnet 11 on your server machine. Note: if you have already sent your FLEXnet server’s HOST ID to ESRD Support, you may skip steps 4-5. 4) After installation, run the FLEX LMtools utility (lmtools.exe). 5) Follow Tip #2 in our Installation and Licensing page to obtain the FLEXnet server’s HOST ID and send to ESRD Support. 6) Save a backup copy of your current FLEXnet license file that is serving other applications. 7) Append the content of the new license file sent to you from your ESRD Support representative to the end of your current license file. Remove the “SERVER” lines from the newly copied information so that you do not have these duplicated within the license file, leaving the original “SERVER” lines at the top of the resulting license file. 8) Run the FLEX LMtools utility (lmtools.exe), and go to the “Start/Stop/Reread” tab. 9) DO NOT stop the license server. Click “ReRead License File”. 10) Verify that the ESRD software licenses are available by selecting the Server Status tab and selecting the “Perform Status Enquiry” button. The status report should display the same license keys that are contained in the license file including those for the ESRD software that you just appended. How Do I Install A New FLEXnet License Server Dedicated To Providing ESRD Software Licensing? 6) When you receive your license file, copy it to your FLEXnet folder (usually \Program Files (x86)\FLEXnet\ on Windows 7 64-bit) and rename it “license.dat”. Make certain that the true file extension is not hidden from view by Windows Explorer. 7) If the ESRD software is the only application on your network being served license from FLEXnet, and you have purchased a floating license(s), you may need to review the settings in the FLEXnet LMtools utility. Select Start>Programs>FLEXnet 11.5>LMTools to start the LMTools utility (lmtools.exe). 8) Select the Configuration using Services bubble in the Service/License File tab. 9) Select the Start/Stop/Reread tab and click Stop Server. 10) Select the Config Services tab. If the paths shown for “lmgrd.exe”, “License File”, and “Debug Log File” are not correct, use the corresponding “Browse” buttons to correct each path as necessary. 11) Activate the switches for “Use NT Services” and “Start Server at Power-Up”. Click Save Service. 12) Select the Start/Stop/Reread tab and select Start Server. 13) The FLEXnet license server is configured and running. You should be able to access this license server and run the ESRD software on any computer within your company local area network. Exit lmtools.exe. 14) Place a copy of the license file named “license.dat” (unedited and including the “SERVER” line(s)) into the top-level ESRD software installation directory on each desktop computer that you have installed the ESRD software. If the system administrator prefers to have the client provide a port number and server name, instead of using a copy of the license.dat, this is also supported. How Do I Increase the Nonlinear Material Stress-Strain Plot Resolution? How Do I Find My HOST ID For ESRD Software Product Licensing? There are several ways to obtain this information, described in Tip #2 on our Installation and Licensing page. However, if requesting a Trial Evaluation of ESRD software products for a desktop machine, it is best to open a command line, type “vol” and hit Enter. Copy the 8-digit alphanumeric Disk Volume Serial Number into the “Message” field of Request ESRD Support, fill out the rest of the form and Submit. How Do I Expand the Material Property Database? How Do I Display Object Numbering? How Do I Define and Assign a Bending Moment? How Do I Debug Problem Meshing Face Error Messages? How Do I Control Which Users Can Access License Features? The FLEXnet administrator can control access and permissions of specific FLEXnet licensing features based on user, node or group. This is performed by creating a FLEXnet Options file (.opt) and placing this file in the root directory of your FLEXnet installation. The concurrent licenses can be held either in license files or in fulfillment records within trusted storage. Options files allow you, as the license administrator, to be as secure or open with licenses as you like. Lines in the options file are limited to 2048 characters. The \ character is a continuation character in options file lines. Use the appropriate options listed in Options File Syntax to create the options file for a vendor daemon using any text editor. Locate the options file anywhere; however, it is recommended that the options file be placed in the same directory as the license file. For example: VENDOR sampled /etc/sampled \[options=]/sample_app/sampled/licenses/sampled.opt enables the sampled vendor daemon to look at the specified options file. The above means that if the name of the vendor daemon (i.e. esrd2.exe) is the same as the options file (esrd2.opt), there is no need to add the path to the options file in the license file. It will be found automatically. EXCLUDE – Deny a user access to a feature. Excludes a user or predefined group of users from the list of who is allowed to use the feature. EXCLUDE supersedes INCLUDE; conflicts between the EXCLUDE list and the INCLUDE list are resolved by the EXCLUDE taking precedence. GROUP – Define a group of users for use with any options. Defines a group of users for use in INCLUDE, INCLUDEALL, INCLUDE_ENTITLEMENT, EXCLUDE, EXCLUDEALL, EXCLUDE_ENTITLEMENT, and RESERVE option lines. INCLUDE – Allow a user to use a feature. Includes a user or predefined group of users in the list of who is allowed to use licenses for this feature. Anyone not in an INCLUDE statement is not allowed to use that feature. EXCLUDE supersedes INCLUDE; conflicts between the EXCLUDE list and the INCLUDE list are resolved by the EXCLUDE taking precedence. RESERVE – Reserves licenses for a user or group of users/hosts. Defines a group called ESRDEngs and lists users matt, eric and andrew. Defines a group called ESRDDevs and lists users kristen, dave and meng. Reserves two licenses for the feature SC10_WIN_SC_Ref3D for the group ESRDEngs. Reserves one license for the feature SC10_WIN_SC_Ref3D for the group ESRDDevs. Prevents the user lori from using the SC10_WIN_SC_Ref3D feature on any system on the network. Causes QUEUED messages to be omitted from the debug log file. The sum total of the licenses reserved must be less than or equal to the number of licenses specified in the FEATURE line. In the example above, there must be a minimum of three licenses on the SC10_WIN_SC_Ref3D FEATURE line. If fewer licenses are available, only the first set of reservations (up to the license limit) is used. How Do I Control the Display of Load Arrows? How Do I Combine Load Cases in Results? How Do I Check My Solution for Errors? How Can I Update All Model Sets? How Can I Perform “Poor Man’s Contact” with Normal Springs? How Can I Improve Multi-Body Contact Efficiency? How Can I Check Load Transfer, Equilibrium and Nodal Reactions In Results? How Can I Change My Display Format? Do I Need the Nonlinear Solver for Multi-Body Contact? Can the Principal Stresses Be Greater Than the Maximum von Mises Stress for a Material Nonlinear Analysis? Can the Modal/Buckling Solver Be Combined with Multi-Body Contact? Can I Write Scripts to Automate StressCheck Professional? If using a concurrent license server, enough available licenses for the StressCheck® modules called during execution of the script (e.g. StressCheck® Core, Linear Elasticity solver, etc.). A scripting platform (e.g. MATLAB by MathWorks, Microsoft Excel VBA, Python, etc.) or Windows development environment (e.g. Microsoft Visual Studio). Referencing/importing/using the StressCheck® COM API (more below). In Excel VBA, it is very easy to automate StressCheck® because all that is required is an installation of Microsoft Office Excel. Can I Use Formulaic Expressions for Results Processing? Can I Run My FLEXnet License Server From My Desktop Machine? There is nothing preventing you from installing and running both ESRD software products and FLEXnet License Manager on the same computer. You should, however, run the FLEXnet License Manager on a computer that is not shutdown or rebooted often so that the floating license keys are accessible to all users when the user requests them. The FLEXnet License Manager requires very little computer resources but the Service needs to be on a computer that remains running when users expect to use ESRD software products. Can I Delete An Automesh Without Deleting the Global Mesh Record? Can I Connect Elements of Different References (i.e. 2D to 3D)? Are All ESRD Software Products Compatible with Windows 7, 8 and 10? Yes, all ESRD software products are compatible with Windows 7 and 8, including StressCheck® Professional and StressCheck®-Powered Apps. 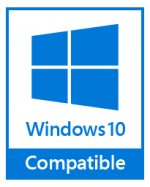 StressCheck® Professional has been tested to meet all of the technical requirements to be Windows 10 compatible.